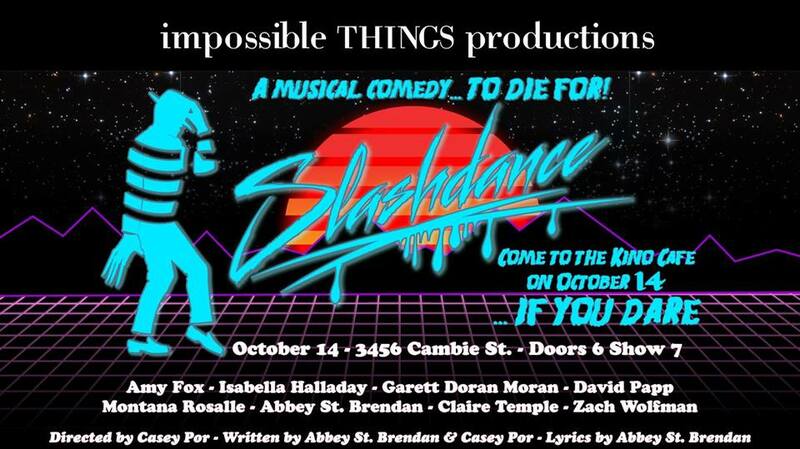 A MUSICAL COMEDY... TO DIE FOR! You chortled for Walt Dismal, chuckled for Nintenuendo, and guffawed for Preacher Comforts! Now, after bringing you the dark and twisted side of fun and games, Impossible Things Productions is abuzz with joy to bring you the lighter side of horror in the musically monstrous SLASHDANCE! We've got all your favorite 80s horror monsters and all your favorite 80s musical hits, mashed and blended into a tall refreshing glass of horror-larity! Have you ever wanted to see Jason dance, Freddy rap, and Pinhead sing? Of course you have! Deep down, in the sticky darkness of the night, we ALL want that - and that's exactly what we're bringing you. Each scene is a never-before-seen improvised sendup of a beloved (and beterrifying) horror franchise, complete with a musical parody you have never before imagined. Come to the Kino on October t̶h̶e̶ ̶1̶3̶t̶h̶,̶ ̶P̶a̶r̶t̶ ̶I̶I̶ 14th and laugh until you die!.... IF YOU DARE! !